TigerHall is a revolutionary Singapore based startup targeting the asian market. 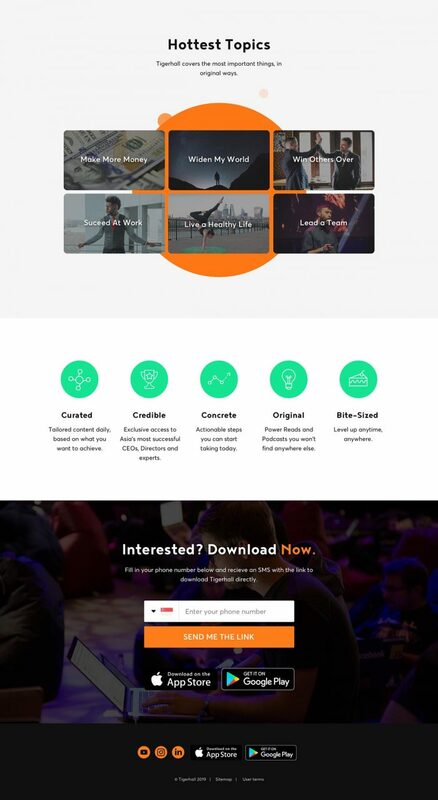 Their IOS app, which was designed by one of Dreamify’s designers back in 2018, offers its users a unique platform for achieving their business, career and lifestyle goals. Users have the opportunity to learn a myriad of skills from Asia’s most successful people by accessing their exclusive podcasts, e-books and events. 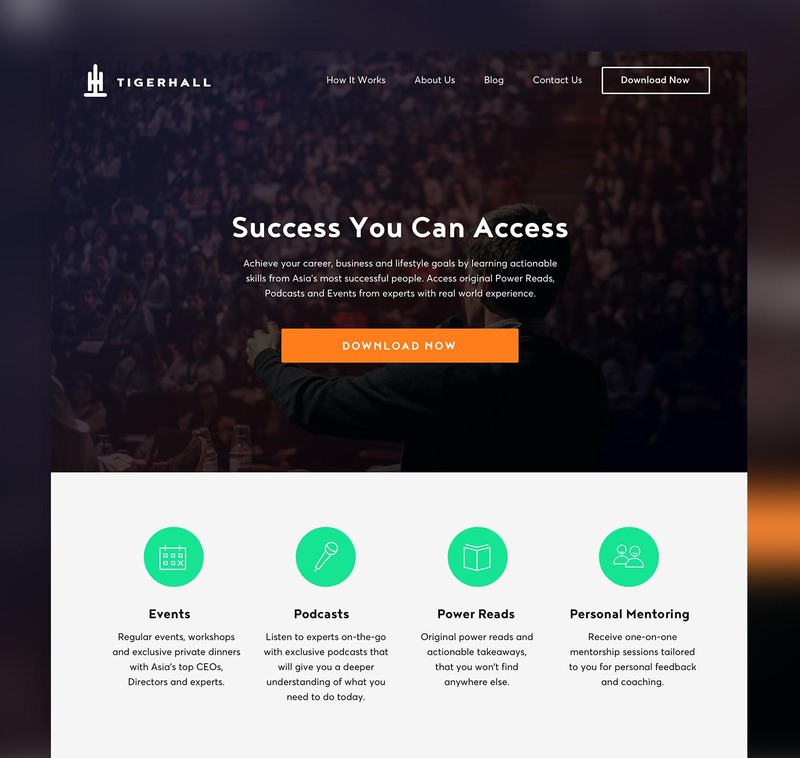 After the successful release of the app, TigerHall was in need of a brand new website design and Dreamify were given the honor and trust to design it. TigerHall wanted a colorful and clean design as well as clear and powerful headlines to convey the brand message in a straightforward way. In other words, a sharp user experience with zero friction for maximum conversion. They also requested a design dominated by pictures of people rather than pictures of the app for one simple reason: TigerHall is all about the growth and self actualization of people. With the client’s requests, needs and feedback acting as a signpost throughout the work process, we delivered a warm and vibrant design along the lines of the app. The bright and uplifting feel was strategically contrasted with a simplistic and clear layout and icon style to guide the user towards action. In other words, our ultimate intention with the design was to provide the minimum information needed for the visitor to quickly and confidently download the app, without any hesitation or unnecessary clutter blocking the way. We would like to thank TigerHall for this exciting project and collaboration. We help businesses from all over the world with digital design. Tell us about what business ideas that keeps you up all night.